Saturn has its own unique brand of aurora that lights up the polar cap, unlike any other planetary aurora known in our solar system. This odd aurora revealed itself to one of the infrared instruments on NASA's Cassini spacecraft. 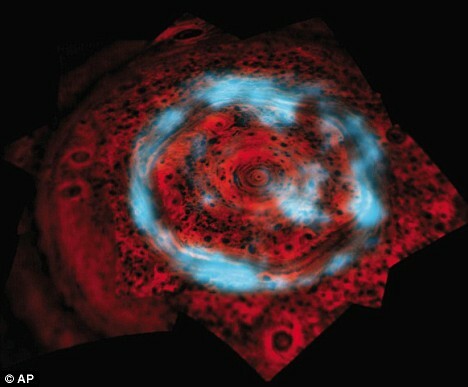 "It's not just a ring of auroras like those we've seen at Jupiter or Earth. This aurora covers an enormous area across the pole. Our current ideas on what forms Saturn's aurora predict that this region should be empty, so finding such a bright aurora here is a fantastic surprise." "Saturn's unique auroral features are telling us there is something special and unforeseen about this planet's magnetosphere and the way it interacts with the solar wind and the planet's atmosphere," said Nick Achilleos, Cassini scientist on the Cassini magnetometer team at the University College London. "Trying to explain its origin will no doubt lead us to physics which uniquely operates in the environment of Saturn." The new infrared aurora appears in a region hidden from NASA's Hubble Space Telescope, which has provided views of Saturn's ultraviolet aurora. Cassini observed it when the spacecraft flew near Saturn's polar region. In infrared light, the aurora sometimes fills the region from around 82 degrees north all the way over the pole. This new aurora is also constantly changing, even disappearing within a 45 minute-period. This aurora also passes over the pole. Maybe a certain resemblance? Interesting picture. Looks like computer graphics a bit, especially the aurora. The hexagon structure may be required to sustain an artificial magnetospheer or potentially heliosphere to protect against cosmic radiation during pole shifts and other "power outages"
I envision things like jacob's ladders on turntables. multiply this by 3 to get your trinity and basic balance x2 inverted gets your hexagon, water holds some influence here, cast out the nine thanks JL. Sacred Geometry in your face. Illuminated by the Neon Plasma of the EU. Two things that go hand in hand like peanut butter and chocolate. Nov. 12) -- An inexplicable new broad region of auroral light has been photographed at Saturn's polar cap. "We've never seen an aurora like this elsewhere," said Tom Stallard, an RCUK Academic Fellow working with Cassini data at the University of Leicester. "It's not just a ring of aurorae like those we've seen at Jupiter or Earth. This one covers an enormous area across the pole. Our current ideas on what forms Saturn's aurorae predict that this region should be empty, so finding such a bright one here is a fantastic surprise." These colorful atmospheric light shows are caused when charged particles stream along the magnetic field of a planet and into its atmosphere. On Earth the charged particles come from the solar wind – a stream of particles that emanates from the sun. Skywatchers at high latitudes know the resulting displays as the Northern Lights. Jupiter's main auroral ring, caused by interactions internal to Jupiter's magnetic environment, is constant in size. Saturn's main aurora, which is caused by the solar wind, changes size dramatically as the wind varies. The newly observed aurora at Saturn, however, doesn't fit into either category. "Saturn's unique auroral features are telling us there is something special and unforeseen about this planet's magnetosphere and the way it interacts with the solar wind and the planet's atmosphere," said Nick Achilleos, a scientist on the Cassini magnetometer team at the University College London. "Trying to explain its origin will no doubt lead us to physics which uniquely operates in the environment of Saturn." The new image, in infrared, was imaged by the Cassini spacecraft. It is reported in the Nov. 13 issue of the journal Nature. large current travelling through the centre of the planet. 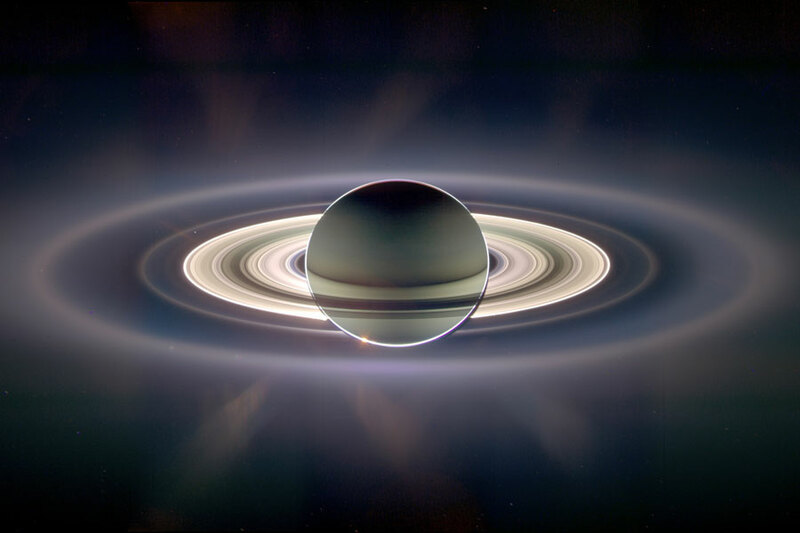 This is not a painting, it is an exagerated color image taken by the Cassini spacecraft. (Official) Explanation: In the shadow of Saturn, unexpected wonders appear. The robotic Cassini spacecraft now orbiting Saturn recently drifted in giant planet's shadow for about 12 hours and looked back toward the eclipsed Sun. Cassini saw a view unlike any other. First, the night side of Saturn is seen to be partly lit by light reflected from its own majestic ring system. Next, the rings themselves appear dark when silhouetted against Saturn, but quite bright when viewed away from Saturn and slightly scattering sunlight, in the above exaggerated color image. Saturn's rings light up so much that new rings were discovered, although they are hard to see in the above image. Visible in spectacular detail, however, is Saturn's E ring, the ring created by the newly discovered ice-fountains of the moon Enceladus, and the outermost ring visible above. Far in the distance, visible on the image left just above the bright main rings, is the almost ignorable pale blue dot of Earth. Is Storm Alley on Saturn a diocotron instability? This may have been covered in a past topic and if so- I apologize. I just happened to be reading through the TPOD Archive and they had a fairly clear photo of the storm belt in Saturn's southern hemisphere, and it occured to me that it looked vaguely like a diocotron instability belted around the planet. Knowing that the north pole of Saturn had that odd hexagon, and seeing those permanent swirls around the bottom of the opposite hemisphere it got me to wondering what the connection was. Does anyone know for sure? I'm not very learned in this stuff, but I'm trying! Re: Is Storm Alley on Saturn a diocotron instability? Those are probably not diocotron instabilities in Saturn's atmosphere. A plasma instability is created by two sheets of charge slipping past each other. Energy is dissipated in the form of two surface waves propagating in opposite directions, with one flowing over the other. However, one thing to keep in mind is that the clouds on Saturn are being blown around the planet by an 1800 kilometer per hour wind. Wind creates fluid dynamic instabilities of its own and it's important not to confuse the two. Diocotron instabilities are inherently short-lived because plasma discharges are short-lived. For instance, a Von Karman Vortex Street instability looks a lot like what's happening on Saturn. Saturn also exhibits Rayleigh-Taylor instabilities in its cloud formations. I see. I just thought it was odd that this line of whorls in the atmosphere only seemed to occur in that one particular belt, and it was on the opposite side from the polar hexagon- thought it might be related to current somehow. I know that the atmosphere shows distinct banding, and they say that the matter in the bands do not all move at the same rate (or even appear to move opposite one another) and I thought perhaps that might be akin to the two charges moving against each other.